FBI declared War against Encryption. Encryption is defeating government intelligence agencies to detect terrorist activities and after the recent ISIS-linked terror attacks in Paris and California, the issue has once again become a political target in Washington. ...and meanwhile, Kazakhstan plans to make it Mandatory for its Citizens to Install Internet Backdoor, allowing the government to intercept users' traffic to any secure website and access everything from web browsing history to usernames and passwords. 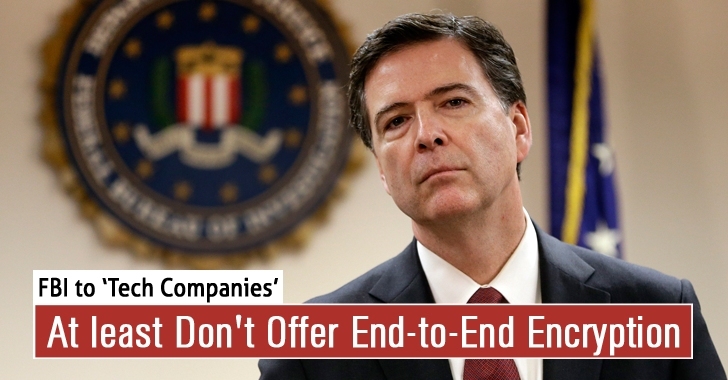 At a Senate hearing on Wednesday, FBI's Director James Comey called for tech companies currently providing users with end-to-end encryption to reconsider "their business model" and simply stop doing that, reported The Intercept. Yes, instead of asking companies for a "backdoor" this time, Comey suggested them to adopt encryption techniques that help federal agencies intercept and turn over end-to-end encrypted communications when necessary. "The government doesn't want a backdoor, but [it] hopes to get to a place where if a judge issues an order, the company figures out how to supply that information to the judge and figures out on its own the best way to do that," said Comey. End-to-end Encryption is a secure communication that encrypts the data on the sender's system before passing it to a company server. The company then passes the encrypted data to the intended recipient, who is the only person who can decrypt it. Recommended Read: How to Install Let's Encrypt Free SSL Certificate On Your Website. Nobody in between, be an application service provider, an Internet service provider (ISP), hacker, or even law enforcement officials, can read the data or tamper with it. However, Comey is asking for the technology companies to retain a readable version of that initial data, just in case the authorities need it. "There are plenty of companies today that provide secure services to their customers and still comply with court orders," he said. "There are plenty of folks who make good phones [and] are able to unlock them in response to a court order." Moreover, Comey also gave an example of a situation in which law enforcement officials faced obstacle because of encryption. Also Read: Peerio — End-to-End Encrypted Secure Messenger and File Sharing App. "In May, when two terrorists attempted to kill a whole lot of people in Garland, Texas, and were stopped by the action of great local law enforcement. That morning, before one of those terrorists, left to try to commit mass murder, he exchanged 109 messages with an overseas terrorist. We have no idea what he said because those messages were encrypted. That is a big problem." So at last, the FBI director did not actually make crystal clear exactly what measures he wants tech companies to adopt, or whether he had favor laws to force the companies to do it. But, he made partially clear that he is not at all satisfied with the current need to encrypt devices.